There’s nothing quite like admiring beautiful holiday lights during the winter. #1. 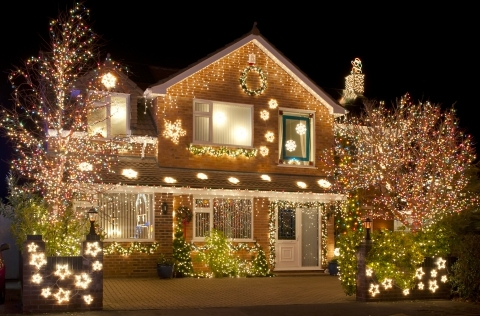 Inspect all of the wiring before you hang your lights. Since your lights are only hung for a small part of the year, they probably spend a great deal of time in storage, where they could easily accumulate damage from many different things. 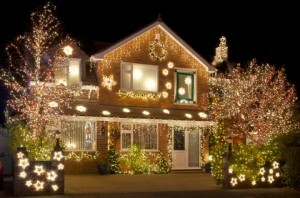 That’s why it’s incredibly important for you to inspect your wires before you hang your lights. If you happen to notice any cut, cracked or otherwise damaged wires, do not hang them up! #2. Make sure that you don’t overload your outlets. Outlet overloads are all too common over the holiday season, and while they seem innocent enough, they put you at a much higher risk for an electrical fire. Rather than overloading a single outlet, plan out your lighting scheme so it is spread between multiple outlets. #3. Use indoor lights inside and outdoor lights outside. Contrary to popular belief, you can’t use indoor and outdoor lights interchangeably. Indoor lights are more vulnerable to weather and rough conditions, so they should only be used indoors! Outdoor lights are designed for weather protection and they are much more durable, which makes them a safe option for outdoor use. Learn more light hanging safety tips by staying tuned for our next blog.